A romantic honeymoon cruise in Alaska aboard the M/V Sikumi is the perfect way to spend an adventure with the one you love. The Sikumi provides a romantic setting to watch the beautiful landscapes of Alaska glide past you. Our staterooms are built with couples in mind, providing a private space for passengers when they aren't involved in activities such as kayaking, whale watching, wildlife viewing, fishing, beachcombing or fine dining. Our chef prepares original and outstanding cuisine each and every day. You can share a romantic meal with your partner at sunset in Prince William Sound; or at sunrise in Ketchikan. Whatever cruise you decide upon, you will never forget the romantic cruise experience that you will enjoy. Our crew can help you celebrate any special occasion with customized menus that will suit your needs. You can also take private excursions such as a leisurely hike, side-by-side kayaking, and an array of other activities just for the two of you. Alternatively, our ship is also perfect for a couples' retreat for you, your honey, and a few good friends. 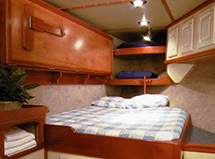 The Sikumi is a sleek, luxurious, Alaskan vessel, with an industrial galley and plush salon. Our guests tend to get quite cozy, absorbing the fine wood interior and amazing vistas out the large windows. Our upper deck is a great place to catch a breath of fresh air and provides an ideal spot to observe the mountains, glaciers, ancient forests and whales that we will be floating by. We invite passengers into the wheelhouse, where they can see the complicated equipment we employ at work. There's no better place to enjoy a romantic cruise than aboard the M/V Sikumi. We think you'll find that no other cruise experience is quite the same. The small boat atmosphere carries over to the friendly and personable crew doing everything in their power to make sure that your romantic cruise is perfect. This photo was taken at a tidewater glacier in Prince William Sound. Cruises aboard the Sikumi provide a wonderful way for couples to explore the magnificence of Alaska with each other. Custom Alaska Cruises is a first rate cruise company. Our flagship, the Sikumi, is perfect for a romantic getaway on Alaskan seas. 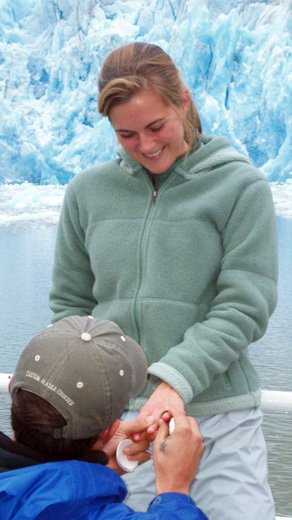 Past Sikumi Captain Mercury proposing to Guide Carlee Ashen in front of Sawyer Glacier, Alaska.